2 flygirls: Bring Out the Bikinis! 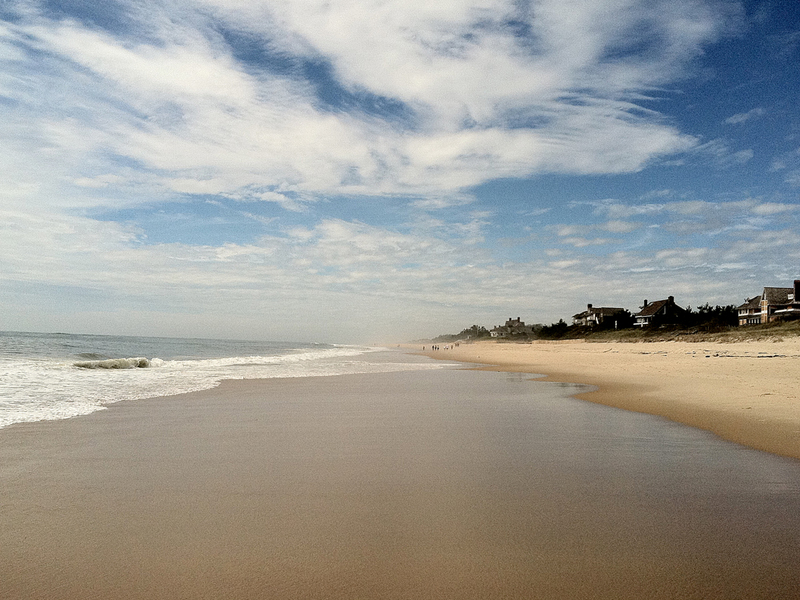 It turns out Josée and I each wrote about our weekend in Montauk. You can first read Josée's short and sweet French-Canadian (cliff notes) version, then my "mini novella" that follows for more juicy details. (I seriously need an editor : ) Enjoy! J: Well, to start with, it did not rain! They (experts), were saying 80% chance of rain and we did not get one single drop. What do ya know? Hyun was getting annoyed with the weather reports but as we were driving/flying to Montauk the skies were far from menacing! So, all was dandy. We got to Montauk about 10ish on Saturday morning and decided to take a walk on the beach since our fishing expedition -guided by Bryan Goulart- was not before 2pm. The place was lovely and deserted of NY tourists :) I guess the "flock of seagulls" were detoured by the supposedly abysmal weather condition. Brief, we had the beach to ourselves. 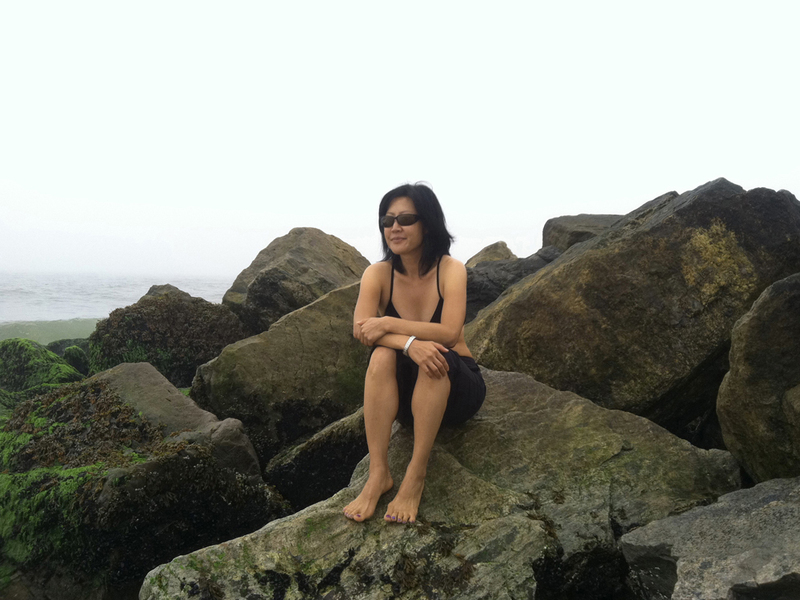 Had lunch at a four star dive named The Dock in Montauk Harbor. Not bad. The beer was excellent! 2 o'clock came and we met Bryan. Got on his boat and drove to the light house. We were joined by another "flock of seagulls" and those were real. They were more or less indicating to us anglers the location of the poissons-- in this case, false albacore. It was rather crazy hectic and really overwhelming. The moment we arrived we had a 4 1/2 minute crash course on how to false-cast an 9 weight rod-- we are used to 5 weight-, two hand fast strip, while not falling over board because to add to the madness the waves were rather high. Lord have mercy! The fish were everywhere and so were the boats. There must of been 25 boats around us. It was CRAZY but fun. We did not catch an albacore and after 4 hours or so we switched to spin rods and Hyun caught our din din, a big fat blue fish. 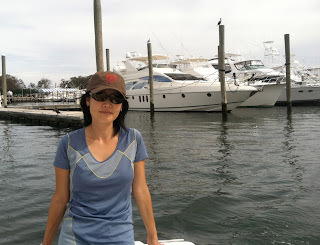 I felt a little seasick and we were so cold, so we returned to the harbor. Elusive Albies, Wardrobe Changes, and Ceviche! H: 80% chance of showers...that's better than 100%. I was trying to be optimistic before our trip. But I was prepared for the worst--fishing in a monsoon on a roller coaster ocean. 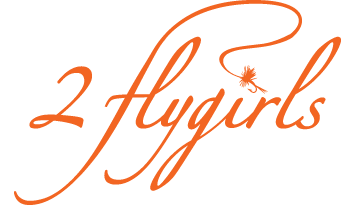 Yeah, that's right, we're tough fly chicks--that's 2 Flygirls with a Capital "F". With both raingear and bikini packed, I met Josée at the train station a little before 8am on Saturday. She was pulling her 28-inch rolling suitcase down the platform. "What the hell do you have in there?" I asked her. "We're only going away for 1 1/2 days." Apparently she had packed for every possible contingency from string bikini to mutton fleece. I bet she even had an evening gown in there, in case we got invited to a fancy Hamptons party. 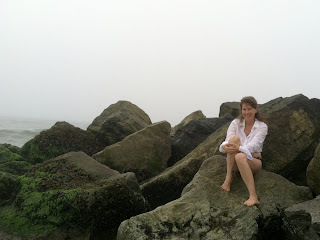 Main beach was nearly deserted and shrouded in fog, lending it a beautiful, otherworldly quality. Josée made her 1st wardrobe change of the day (skillfully donning bikini in the back seat). We spent a good hour walking along the beach, playing in the waves, and taking pictures. We then drove to Montauk for a quick lunch before meeting up with our guide, Bryan Goulart, at the Star Island Marina. It's 2pm, hot and muggy. We can't wait to get out on the water. I'd forgotten how laid back and chill Bryan is (he was our guide the 1st time we attempted saltwater fly fishing). He instantly put both of us at ease as we headed out of the harbor in search of our quarry: false albacore. I thought we'd be fishing for striped bass and bluefish but Bryan says that the albies are running. Bryan seemed to know all the other boat captains and guides on the water. A women's voice came over on the radio. She joked about wanting to see Bryan in a speedo. Bryan tells us it's Amanda, a guide friend of his and also his neighbor. Josée and I are both thinking: cool, a female fly fishing guide and she has a sense of humor--definitely someone we'd like to meet. It's not till after we meet her that we figure out she's one of the flyfishergirls of flyfishergirl.com (a great women's fly fishing website/online community that we joined shortly after starting 2flygirls.com). Amanda (Switzer) and her husband Steve recently started Rise Fishing Co, an innovative new rod company. In fact, we used their rods that day. Bryan stops the boat so we can practice casting the 9 wts he has set up with clouser minnows. I guess the 30+ push-ups every other day has paid off because the 9 wt feels rather light in my hand. And since Josée has been religiously doing her ups every day, she's casting that baby like it's a 7 wt. Bryan laid down the game plan: once we locate the albies, he will get us close and cut the engine so we drift towards them; with albies, it's critical to get your line out as fast as possible and a hand-over-hand strip is better than a single-hand strip; plus we should strip set the line when we get a hit. We practiced for a few minutes before circling birds, broken water, and albies are spotted in the distance. It was a mad race to reach them first. It seemed all the boats in Montauk had converged into one small space for an impromptu oceanside rave. Bryan got us close and told us to cast. It was a frenzy of boats, feverishly casting anglers, diving birds, boiling water... You couldn't help but get caught up in the excitement. All that was lacking was a good DJ and soundtrack. At one point, I found myself hynotized by the action--I watched as several albies zoomed by, so close I could make out the details of their muscular torpedo-shaped bodies for a split second before they disappeared like a mirage. I've caught a schoolie yellowfin tuna once before on conventional tackle. I remember my hands being numb and shoulders and arms aching from the battle. I can't imagine what the fight would be like on a fly rod. By the end of the afternoon, the elusive albies teased us twice more--surfacing for what seemed like seconds before vanishing into the depths. Despite our lack of success with the albies, we had fun. 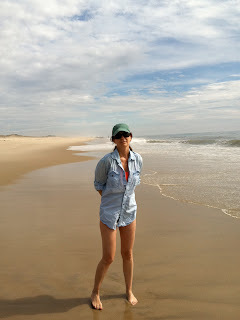 It was Bryan who starting joking about Josée's multitude of wardrobe changes, 7 in all: stripping down to her bikini and then adding layers as the day progressed, from her coverup shirt, to wet wading pants, long-sleeve t-shirt, fleece, rainjacket... The conversation drifted to the 1st time we fished together. Our friend Jon Fisher had caught a bluefish which Josée took home and made into ceviche, using Bryan's recipe. At the mention of ceviche, we decided to try and catch something for dinner. Bryan had some spin rods on board so we all started fishing. Bryan missed a fish (too busy talking : ) while Josée got all quiet on us--she was feeling seasick. I continued to cast out my green gummy minnow and reel it in, when suddenly, a flash of silver/white appeared as my lure came near the surface. I cast once more, this time reeling my line in with more energy. Fish on! 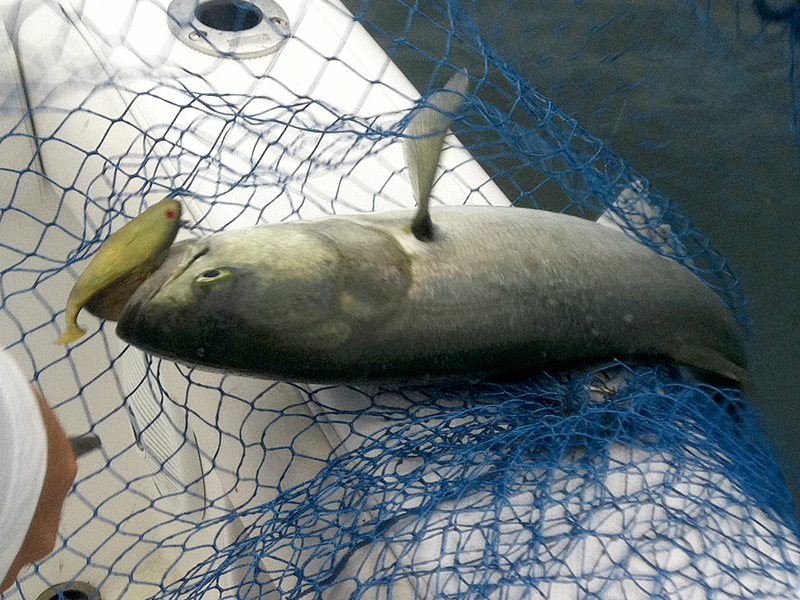 It was a nice bluefish. Ceviche was on the menu tonight--yum! 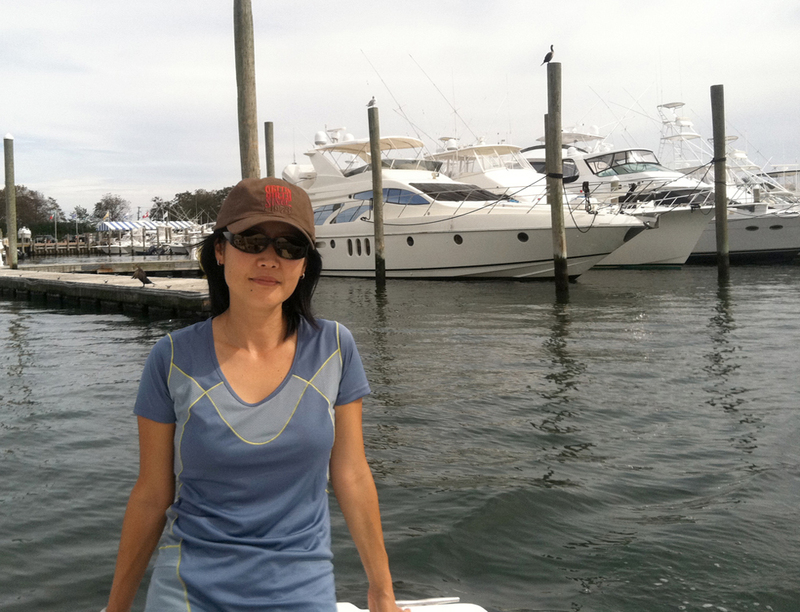 Josée started looking a bit green like my minnow so we headed back to the marina where Bryan fileted our catch. 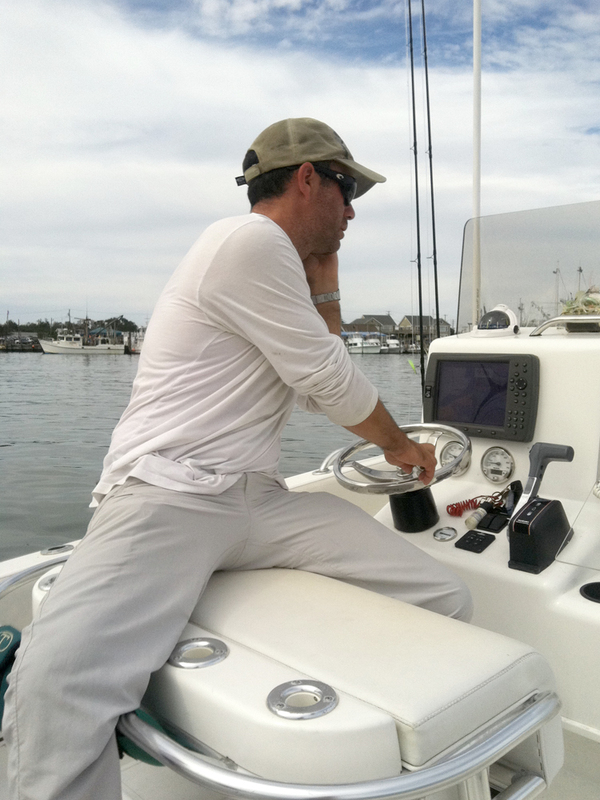 Right next to him, another captain/guide was about to disembowel a huge striped bass, the size of my 4-year-old niece.